Okay, I’m not really keeping track of how many craft projects I’ve done in my lifetime. 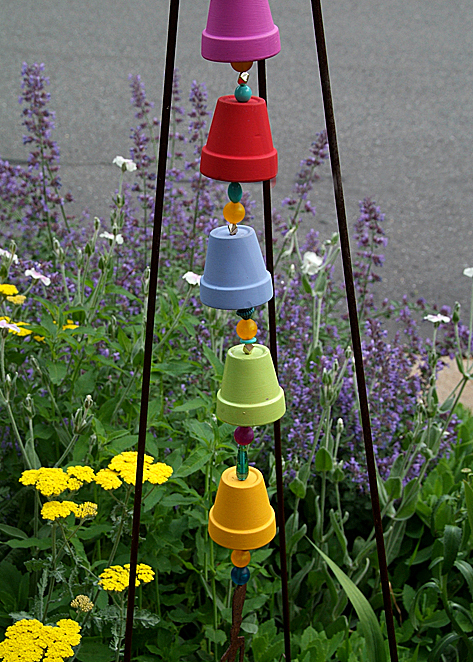 This is my latest one for the garden—a “bell” tower wind chime, of sorts. You can get all of the supplies from your local craft store. Step 1: Using cheap craft paint, I painted each miniature pot a different color. I recommend sealing the pots after painting with a spray on or brush on outdoor sealant to keep the paint from peeling or fading too soon. I haven’t sealed these yet. Step 2: I measured out how long I wanted my tower/chime and cut a piece of rusty wire to fit. I threaded the wire through a rusty implement that had broken off an old wind chime (it’s a garden tool), thus forming the foundation or bottom of my bell tower. Step 3: I threaded cheap multi-colored beads (from my brief jewelry-making phase) onto thick, flexible craft wire, followed by the first pot. I arranged them by color, grouping dark to light and warm to cool. I added more beads, then the next pot, and so on. I used the less colorful beads in the area inside each pot because those beads wouldn’t be visible. The prettiest beads were saved for the display area peeking out below each pot. Remember, if you’re using the thicker wire, you’ll need beads with larger openings for threading. Step 4: When all the pots (I used eight in total) were threaded onto the wire, I finished off the top with a large loop. You can hang this on virtually anything: a trellis, from a tree branch, dangle from a shepherd’s hook, etc. I also made simple “garden jewelry” (sans the little pots) with the same rusty craft wire, multi-colored beads, and another garden tool at the bottom. Both projects were cheap, easy, and fast to make—a great project for a garden club or summer project for kids. Very cute! My garden might need one of those. I am so tempted to call them Fiesta pots 🙂 They are adorable!! How adorably cute, colorful, bright and cheery! Cindy, I forgot to mention in my comment that now I know what the inside of your brain is like — adorably cute, colorful, bright and cheery! It does look colorful and visually appealing! I enjoy looking at artwork and sculptures, especially those that are abstract and have geometric shapes with lots of colors. This relates to the graphic design projects I work on. Hooray! You are quickly becoming so versatile and adept, Martha. I love this ! I have the perfect spot for one of these. Great Idea as a summer project with the kids. (Spring break perhaps..so it’s ready to hang for summer) Thanks for sharing . Please let me know if you are interested and if so, will you send me the photo without a watermark? I will ensure that your photo is credited as well as your blog. Is it just beautifully decorative or does it make noise? I would consider it more “beautifully decorative,” although when the wind blows hard enough, you do hear the clank of the beads against the pots! Hi Richard, I used the 2.5″ pots from Michael’s. You could use slightly smaller or slightly larger, though. Hi Cindy, I see you have a tripod did you buy it or something that you recicled. Canyou show us how you tied it to the tripod? Love you work! Just gorgeous! Hi Joan! I bought mine at Michael’s. They have different sizes. Love this idea & plan on making it! This is awesome. I’m going to try this at a monthly craft night I host. If you made this longer and hung it from the roof, I imagine this would make a fantastic (and beautiful) rain chain! What do you think?